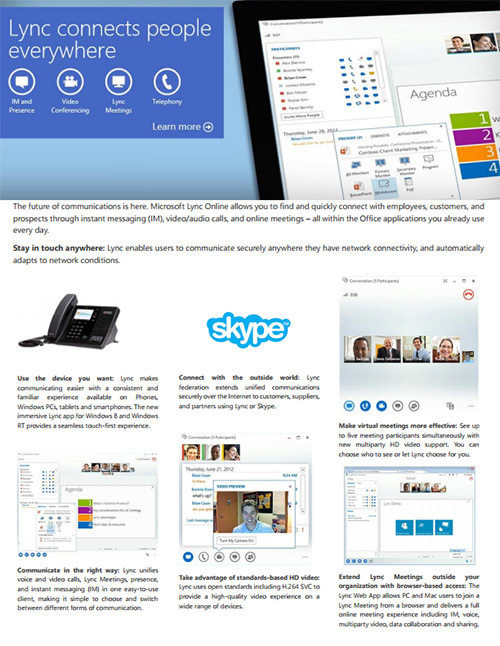 BlueCloud Skype for Business (formerly known as Microsoft Lync) Voice Services allows your employees to locate and quickly connect with other employees, customers, suppliers and business partners—through instant messaging, video and voice calls, and online group meetings. BlueEdge Consulting deploys the solution so your staff can access all of these features within the Microsoft Office 365 suite of applications. We partner with voice cloud providers to deliver Microsoft Skype for Business as a hosted PBX system or alongside your existing PBX system. Your businesses can access the solution on a monthly subscription through Microsoft Office 365 on a per-user basis. This approach eliminates initial capital outlays as well as ongoing support and maintenance costs. Stay in touch at all times—communicate securely from any network connection or over the Internet and work seamlessly as the system automatically adapts to network conditions. Communicate through any device—a consistent and familiar experience on phones, PCs, tablets and smartphones. Unify all communications—voice and video meetings, presence and instant messaging—all through one easy-to-use interface that makes it simple to switch between different communication modes. Make virtual meetings more interactive— with the ability to see up to five participants simultaneously. Extend your communication capabilities—by giving customers, suppliers, and partners access to all the same features through any device using their Internet browser. BlueCloud Skype for Business Voice Services leverages standards-based high-definition video to provide a high-quality collaborative experience on a wide range of devices that otherwise would be too cost-prohibitive for small companies implement. The solution makes it easy for your entire team to communicate wherever they are—with no software or servers for the business to purchase, maintain, or deploy.